Hello and welcome back! I'm here again for the next round of Fancy Friday! I'm so glad to be back here to share today. You might have just come from the lovely and talented Krista Frattin. I know she wowed you with her project and I hope to do the same! This month, we challenged each other to use at least one color that we don't normally use. The first color that came to mind for me was Marina Mist. I have to say after making this card, I'm sorry I have been overlooking this color. It's great for the sky and the balloons here, don't you think? Hello and welcome back! I'm back to play along with the Global Design Project #23 challenge with a theme of balloons. Hello and welcome back to the next Artisan Design Team Blog Hop. It's time for another Artisan Design Team Blog Hop! You're in for a treat because we have so much talent and so many different styles represented by these 20 women from around the globe. Be sure to use something like Google Translate for those blogs not in your native language. You might have just arrived from the lovely Krista Frattin in Canada! Either way, I'm glad to have you here. We're highlighting our projects from this month's Artisan Facebook post on the Stampin' Up! page. Hello and welcome back! Today I have a card to share here on my blog that was shared on Instagram. Did you know that the Artisan Design Team shares tips and tricks on Instagram on Tuesdays? Just search for the hashtag #adttipsandtricks on Instagram under the @Stampinup account, and you can follow along with us this year! Here is the card that I shared. I used the Balloon Bouquet Punch to cut my balloons from the Perfectly Artistic Designer Series Paper. With just a little added stamping from the Balloon Celebration Stamp Set, and my card was complete! This card really came together quickly. I used Pumpkin Pie ink, and the birthday greeting is heat embossed in white on a piece of Pumpkin Pie Cardstock. Hello and welcome back! Today I'm here with our monthly One Stamp At a Time Blog Hop! The theme for this month is Love Is In the Air, so I'm sure there will be lots of projects full of heart and perfect for the upcoming holiday. I made some little Valentines that would be really easy for you to duplicate in multiples, as well as a small treat box. Hello and welcome back! I'm popping in today to share a quick thank you card with you. It all started with a 4" x 5.5" piece of watercolor paper, and inks in Crushed Curry, Pumpkin Pie, Watermelon Wonder and Blushing Bride. Hello and welcome back! It's time for another Artisan Design Team Blog Hop! You're in for a treat because we have so much talent and so many different styles represented by these 20 women from around the globe. You might have just arrived from the lovely Krista Frattin in Canada! Either way, I'm glad to have you here. 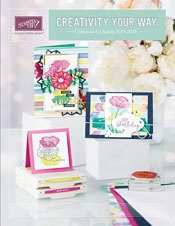 We're highlighting products from the Stampin' Up! 2016 Occasions catalog this week. Hello and welcome back! Today I have a birthday card to share using a simple watercolor technique and the fabulous Balloon Celebration stamp set.